The Game of Thrones hacking saga continues, but this time it's the HBO's and GOT's official Twitter and Facebook accounts got compromised, rather than upcoming episodes. 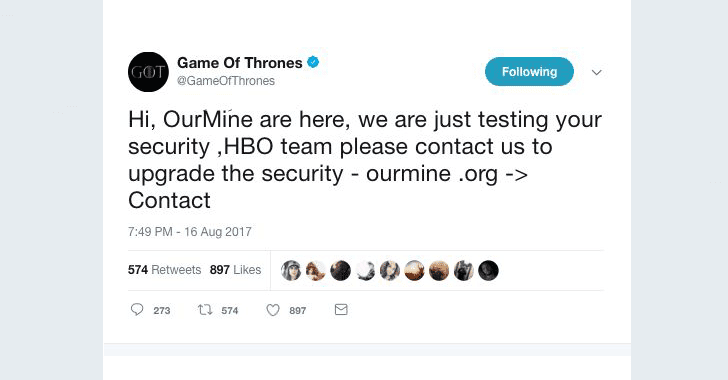 "Hi, OurMine are here, we are just testing your security, HBO team, please contact us to upgrade the security," followed by a contact link for the group. In most of the cases, Ourmine hackers gain access to the social media accounts by credentials exposed in previous, publicly known data breaches. However, the hacking group does not seem to ever go beyond just demonstrating its ability to take over the account, without doing much damage to the accounts or its protected information. OurMine offers companies security against hacking, charging up to $5,000 for a "scan" of their social media accounts, site security holes, and other security vulnerabilities, and advertises its commercial services by breaking into famous accounts. 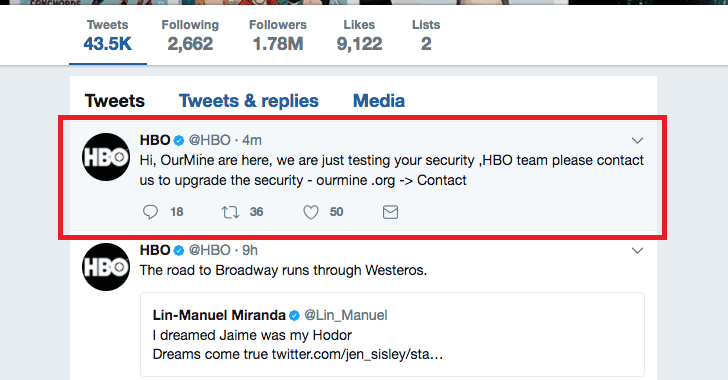 HBO managed to remove the offending tweets shortly after the hackers posted them. Just yesterday, in a devastating blunder, HBO Spain accidentally aired Episode 6 of Game of Thrones season 7 five days prior to its official premiere. The popular entertaining company is also facing a threat from hacker or group of hackers who claimed to have obtained nearly 1.5 terabytes of information from HBO. Over two weeks ago, the unknown hackers dropped episodes of "Ballers" and "Room 104," along with a script of the fourth episode of Game of Thrones on the internet. This leak was followed by another dump of a half-gigabyte sample of stolen data, including the company's emails, employment agreements, balance sheets, and the script of the upcoming GOT episode, demanding a ransom—nearly $6 Million in Bitcoins. Although it was revealed that the company offered hackers $250,000 for extending the ransom payment deadline by one week, the proposal apparently failed to satisfy hackers, and they threatened to release more data every Sunday until the full ransom was paid.